Wood-fired cooking has expanded beyond traditional BBQ as equipment for both the home user and the commercial kitchen has evolved. By incorporating smoke vapor into various foods and beverages, the entire dynamic of that food is transitioned. We have culinary quality smoking wood chunks for sale! But not just any chunks. At SmokinLicious®, we've taken the hard work out of selecting smoking wood chunks that are appropriate for all types of food and beverage, as well as all styles of wood-fired cooking. Wood selection is essential to achieve a balance with the other ingredients of the food exposed to the wood-fired cooking method. We pride ourselves on that fact that we are able to offer eight wood species that are considered ideal for wood-fired cooking methods: Ash, American Beech, Eastern Alder, Hickory, Red Oak, Sugar Maple, White Oak, Wild Chery. Our culinary wood chunks are derived from our special hand-filet process which is offered in two different filet sizes: Single or Double Filet. What is fileting? This is our customized splitting process that studies the wood grain and then produces a special cut or "filet" of the wood. The Single Filet results in wood pieces that are approximately 3"x4" in width with a length 4". The Double Filet produces wood pieces that are approximately 2"X2" in width and height, with a length of 3". By providing the two distinct filet cuts, SmokinLicious® is allowing the user to match the wood more accurately to their specific cooking equipment.Match your Cooker?. In addition to our Single and Double Filet wood chunks, we offer a larger chunk Wood Blocks, which includes wood piece sizes 4"X 4"X6" see Wood Blocks. We take great care to ensure that our woods, after fileting, have a higher moisture content. We even go as far as to take a moisture reading of the wood at the time of packaging your order to be sure you are getting the freshest product available! As always, please store your unused wood in a cool, dry location making sure to allow the wood to breathe. The best way to ensure good air circulation is to keep the original carton open, punching some holes on all sides of the box for proper ventilation. 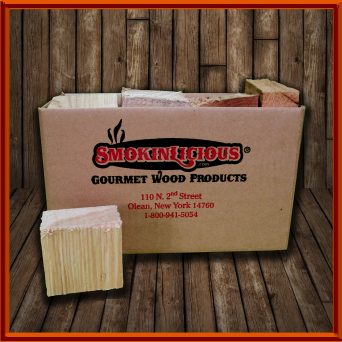 For your convenience, we offer cardboard boxes of our select SmokinLicious ® Gourmet Wood Chunks. As always, in your choice of woods AND you can select 3 woods in the single carton purchase, something not found anywhere else! To specify your wood selections for a mixture, please type the woods in the Wood Selections box in the shopping cart area! Remember, you may select 3 hardwoods for a mixture. I really appreciate the great customer service and the personal touch. I love your products and can't go back to crappy box store chunks. I recommend SmokinLicious to all of my barbecue pals! I'm really pleased with the product. Nice clean smoke and plenty of it ... and with no bark I'm not cooking in a bug crematorium either. If you would like a quote for specially cut chunk sizes or quantities, please fax us @ 716-372-0439, call 1-800-941-5054 or Info@smokinlicious.ca.